get tans at the beach. featuring Baywatch Barbie is a little risque'. I tore out these two ads from Surfing magazine years ago. Surfing is a real magazine, and you can find it in the sports sections of magazines for sale in larger bookstores, even in locations far from the ocean. 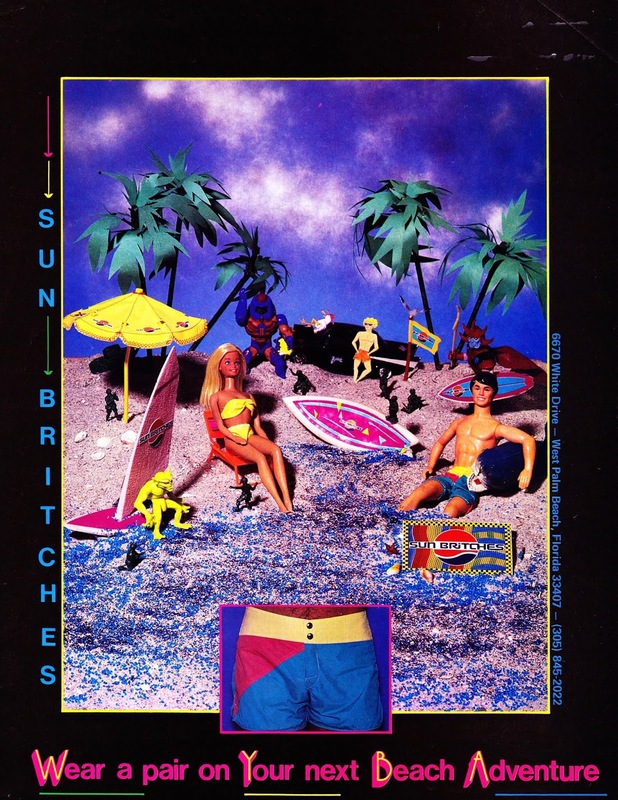 The color one advertising Sun Britches board shorts is from September 1984. It pictures Sunsational Malibu Barbie, Bridegroom Todd, Mattel Man E Faces from He-Man (the burgundy and purple alien), and Overlord (red spiked helmet) and a lime green demon from Galoob's Blackstar. There are also some generic plastic Army men. 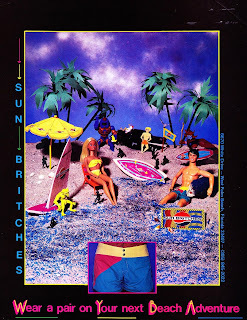 Notice that Barbie's and Todd's swimsuits are handmade by Sun Britches. I don't know the date on the black-and-white ad for Spyder surfboards, but it would have had to have been some time in 1995 or after, as that was when Baywatch Barbie was sold. These ads are highly amusing, but I suspect they violate all sorts of copyright laws. I was surpised that the editors and publishers of Surfing allowed them to be printed in the magazine. I also never read about any complaints from Mattel and Galoob after their publication.